Peter is unlike anyone she's ever known. Impetuous and brave, he both scares and enthralls her. As the leader of the Lost Boys, the most fearsome of Neverland's inhabitants, Peter is an unthinkable match for Tiger Lily. Soon, she is risking everything - her family, her future - to be with him. When she is faced with marriage to a terrible man in her own tribe, she must choose between the life she's always known and running away to an uncertain future with Peter. So after binge watching "The New Adventures of Peter and Wendy" on YouTube, I'm still on a bit of a Peter Pan kick. Naturally this led me to Tiger Lily by Jodi Lynn Anderson, a title that I've heard rave reviews about for years. And if you're a fan of Neverland, this is actually a pretty faithful adaption of the world. The story is narrated by Tinkerbell (which ended up being way less obnoxious than I imagined) and includes the mermaids, Lost Boys, and pirates. There's not quite as much Hook as I would like (preferably one that looks a lot like Colin O'Donoghue's portrayal on Once Upon a Time). Tiger Lily is an odd bird. She doesn't really fit into her tribe, swims agains the stream (I originally had grain instead of stream written...which makes no sense at all. I'm so very bad at sayings!). She was raised by the tribe shaman who is a cross dresser and is promised to a real tool of a man. Actually, "tool" is too nice a word for this man. Oh, and she chose to go against the tribe's wishes and saved an Englishman who had washed up on shore. Hint hint, bad idea. 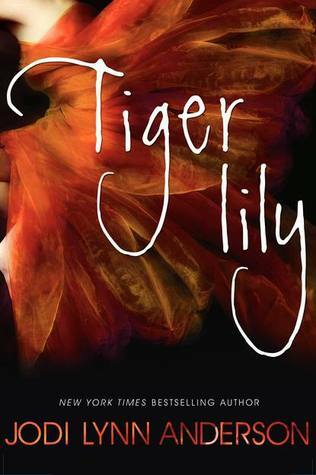 One things leads to another and Tiger Lily finds Peter who brings adventure and affection into her life. Peter isn't quite the jerk that the original story develops. I really don't like the original Peter and his selfish overly self-confident ways. There's a big build up for a serious confrontation with the pirates (Mr. Smee has been stalking Tiger Lily throughout the whole book), and then...nothing. My one pet peeve about the book. I wanted more at the end. I wanted someone dead (from violence. I need to make that distinction). I'm not morbid. I promise. It's a happy ending, and I actually liked the ending, but the final act just needed a little more oomph. Still. A fun read. And if you do, let me know what you think.